The Red Sox appear to have made their decision on the catching situation, signing Varitek to a one-year, two million dollar contract. There is an additional potential of $300,000 in incentives. 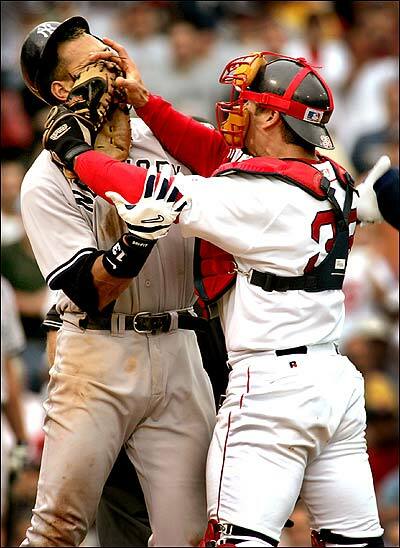 Varitek will serve as back-up and mentor to Jarrod Saltalamacchia. Tek was having a solid season in the back-up role until an injury ended his summer early. Both Saltalamacchia and Varitek are switch-hitters, but Saltalamacchia, for now at least, is more proficient from the left side and Varitek more potent from the right side. That split will allow manager Terry Francona to spot Varitek mostly against opposing lefthanded starters. Saltalamacchia is only 25 years old, and was one a much sought-after young catcher just a couple of years ago. Under the tutelage of a Jason Varitek, perhaps he will finally live up to that potential. I am one of the few not upset by the non-signing of Victor Martinez. I’m not sure when he turned into Johnny Bench in the eyes of Red Sox Nation, but time will prove the wisdom of letting him go. Four years is far too long for a 32-year-old catcher, who wasn’t much of a defensive catcher to begin with. Detroit has already announced he will primarily DH, so they essentially have an aging 13-million-dollar DH who will never be nearly as productive as David Ortiz. Martinez’s best year at the plate was 2007 when he hit 25 homers and batted in 114. Papi’s worst season with the Sox was his injury-shortened 2008 when he hit 23 homers and had 89 RBI. Bring on the Tek/Salty combo, and let’s see where the Sox spend Martinez’s money. Next post Sox Get Gonzalez. And Breakfast Becomes Beerfest.